Tripp Lite's TLP606DMUSB offers economical AC surge suppression for protection of workstations, desktop PCs, telecom systems and other sensitive electronics. Built-in AC surge suppression shields connected equipment from damage and performance problems due to transient surges. USB charging ports offer fast charging for smartphones, tablets, MP3 players and other portable devices. TLP606DMUSB offers 6 total outlets, 6 foot cord, 2 USB charging ports and diagnostic LED to warn of suppressor damage. AC suppression rated at 2100 joules shields equipment from surges and line noise. This matte black surge suppressor has clamps that attach to the side of the desk, workbench or table. 2 knobs easily clamp to desk for better accessibility to plugs - 4 standard and 2 adapter spaced plugs. 2100-joule surge protection rating – More joules mean more protection! 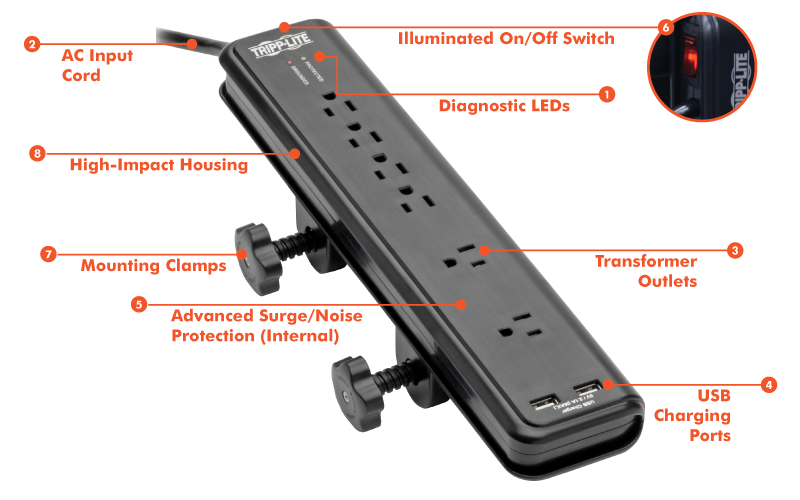 This surge protector is perfect for home and office electronics of all kinds, including computers, monitors, printers, wireless routers, televisions, video game consoles, streaming media players, sound systems, device chargers, desk lamps and small appliances. It also provides convenient USB charging power for smartphones, tablets and other devices.